There’s a concept in the law called duress. And it was very much on the minds of the very first lawmakers in what was then the Territory of Arizona. Yep, The Legal Genealogist is heading west later this week, to speak at the West Valley Genealogical Society’s 2019 Annual Seminar, and so I’m poking around in some of those early Arizona laws. And there’s one that’s a doozy, reflecting a mindset that’s very much a quirk of early law. Now this notion of duress isn’t quirky — if somebody puts a gun to your head and tells you to take money out of the cash register, and you do it not because you’re a willing participant but only because you have an aversion to bullets in your brain, sending you to prison for robbery or theft doesn’t make a lot of sense, does it? Oh, my. The married woman’s “he told me to do it” defense. 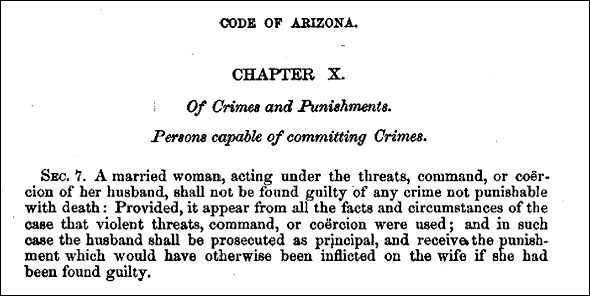 And this early Arizona law is pretty much in keeping with that notion, isn’t it? Except, at least, that in early Arizona, the law excluded the most serious offenses — those punishable by death. A wife couldn’t kill somebody, for example, and get off on the grounds that her husband told her to do it. The laws — and the times — do change. Cite/link to this post: Judy G. Russell, “The defense of coverture,” The Legal Genealogist (https://www.legalgenealogist.com/blog : posted 12 Feb 2019). This is a timely, personal issue for me. Where can I read about this to understand it in the current (2019) of Georgia? There is no longer a defense of coverture (no defense that can be claimed by a married woman just because her husband told her to do something). The defense of duress, available to anyone male or female, is covered by Georgia Code § 16-3-26 – Coercion. You can read it online here.